1. Today, Texas SIL and her family arrive for a visit. They'll be splitting time between visiting with her family and her husband's family but staying with us the whole visit. We are excited to see them - and readying ourselves for 3 times the usual number of people in the house, including 2 young boys. I wonder how long they will be here before one of them asks,"Uncle SP, can we play Mario with you?"!!!! I love that they like playing games with Uncle SP! 2. That being said, Uncle SP better remember to charge the game controllers. He said that this morning. Hopefully he'll read this later and remember to get things charging...?! 3. Thanks to Googer and SP's dad, the rotted wood fence has been removed. Now we have 2 more problems/stages of this fun issue: 1: getting rid of the wood posts because they cannot just go out in regular trash (we tried!) - no idea how we'll dispose of them, and 2: replacing the fence. It was there to simply mark where the hillside suddenly drops off and we are afraid that someone will not see/realize just how sudden and steep the drop is and fall and seriously injure themselves. Right now, the massive woodsy overgrowth kind of hides the hillside, which makes it more dangerous. 4. 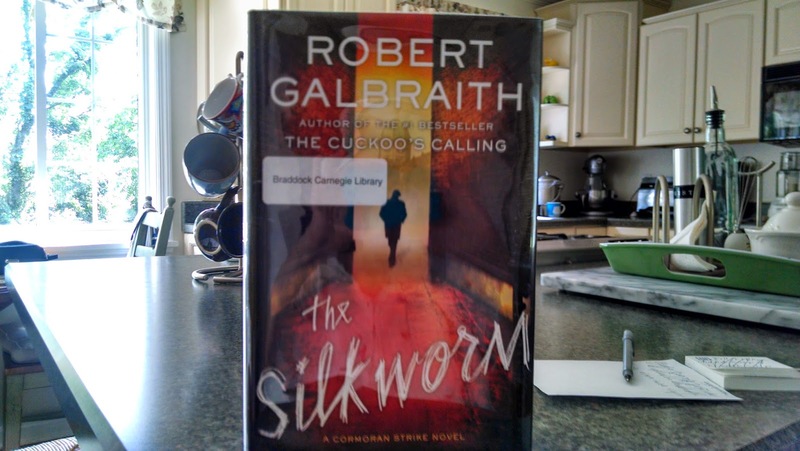 This week I read The Silkworm by Robert Galbraith (aka JK Rowling). I've always enjoyed mystery/detective/crime novels, and I really enjoyed The Cuckoo's Calling (reading it before I knew Galbraith = Rowling), the first novel to feature private investigator Cormoran Strike. I also really enjoyed the second Strike novel. In fact, I sent SP to the basement one evening (I'm sure he was oh so sad to be sent to the mancave to play games and watch TV or whatever he does down there) so that I could finish the book because I wanted to know the identity of the killer and couldn't put the book down! 5. Last Friday we went to a Pirates game with a tailgate on a Gateway Clipper boat beforehand. It was a work outing for SP and it was nice to meet some of his co-workers. It was a beautiful night and I loved not just being at the game but also being on the river for a while. Keeping the Dutch oven full of ribs warm on the grill. 6. Last weekend we grilled ribs. This time, we took Texas SIL's advice and tried slow cooking the ribs in our Dutch oven instead of in foil packets. I must say, it's much easier than creating all those foil packets and there's no danger of poking a hole and having the ribs dry out! They turned out delicious. We also grilled zucchini and tomatoes, sauteed peas form our garden, and made potato salad with herbs form the pots on the deck. 7. 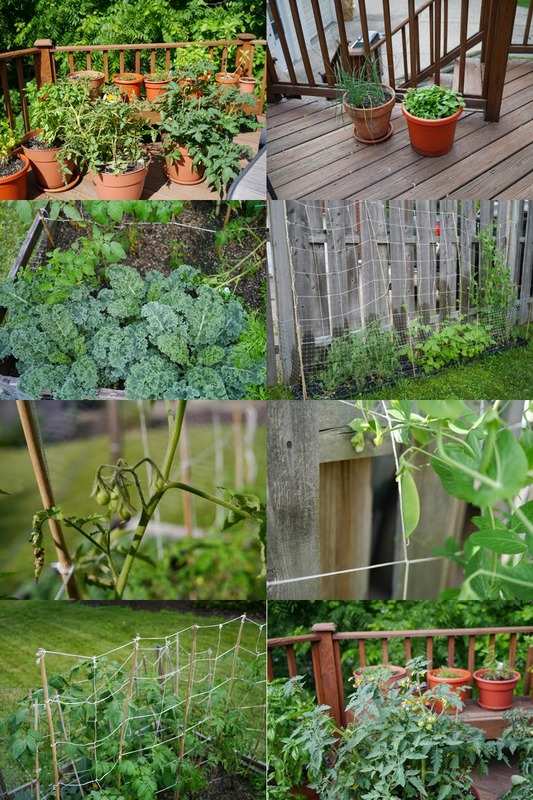 Speaking of the garden and deck herbs, here are some photos. After vacation, after we fed everything some plant/garden food and then everything got a good dose of hazy, hot, humid, rainy, and sunshiny weather, and now, things seem to be taking off. I still think we should have started our seeds earlier, but... there's always next year. But things are growing. Except for the dill. The dill looks sad and scrawny and brown. 8. SP is off today and tomorrow, so he has a 4 day holiday weekend. Whoo! Happy 4th of July tomorrow!